On Mother’s Day, IFC is planning to run an all-day marathon of Frank Perry’s 1981 film Mommie Dearest, a ghoulishly unflattering biopic of screen legend Joan Crawford based on an inflammatory 1977 tell-all book written by her adopted daughter, Christina. More than anything, that film, especially Faye Dunaway’s operatic lead performance, has cemented Crawford’s image as a soulless, child-abusing monster. In two hours, Perry’s film undid what Crawford spent 40 years building up. Now, writer Angelica Jade Bastien makes a case for distinguishing between the real, complicated Crawford from her campy, cartoonish image in an editorial called “The Feminine Grotesque: On The Warped Legacy Of Joan Crawford.” The article is not an apology for child abuse or an attempt to discredit the claims of Crawford’s daughter. Instead, Bastien writes that she is interested in the reasons behind Crawford’s postmortem downfall. She chalks it up to “a resentment of professional women” and evidence of the troubles that older actresses have in an industry that prizes youth. 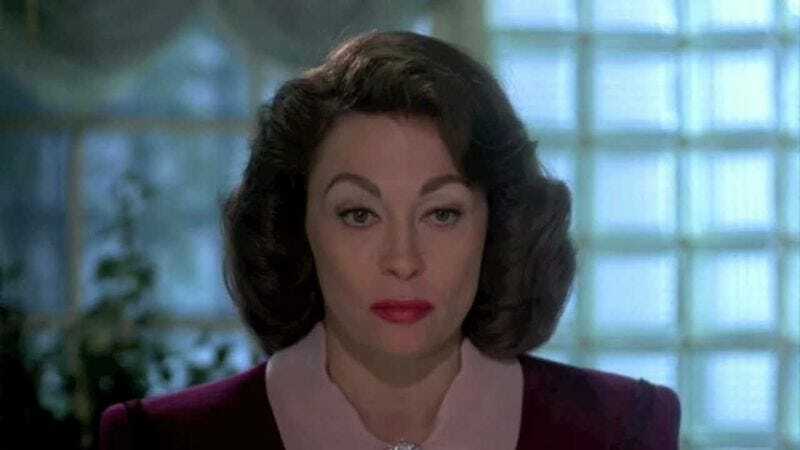 Crawford’s creepy Mommie Dearest image is really an extension of the “hagsploitation” roles she was playing on the back half of her career, including turns in Robert Aldrich’s Whatever Happened To Baby Jane? and William Castle’s Straight-Jacket. But to focus solely on this aspect of her work is to shortchange Crawford badly. The actress played “a startling breadth” of roles over the course of her career and could be “a good, sometimes even great actress,” the critic writes. Crawford’s own “hardscrabble” childhood lent her acting “an authenticity and edge” other stars of her generation lacked. Reflecting on Crawford’s Oscar-winning turn in Mildred Pierce, Bastien writes: “She had the uncanny skill to adjust her looks to simultaneously reflect and seem slightly ahead of whatever was the conception of the modern woman at the time.” In studying the entirety of Crawford’s filmography, as well as photographs taken of her at various stages in her life, Bastien sees a humanity that is simply not present in Mommie Dearest. Perhaps viewers can take a break from the IFC marathon to screen 1956’s Autumn Leaves, again directed by Aldrich, which contains “one of her most emotionally realized performances.” There is much more to Crawford than axes and wire hangers.